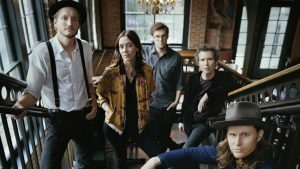 The Lumineers kick off their UK arena dates with a show at the SSE Hydro Glasgow on Friday 22 November 2019. Tickets for the tour are on general sale from Friday 12 April 2019, check with Ticketmaster here to get yours. Hailing from Denver, Colorado, the Lumineers self titled debut album featured the singles ”Submarine”, “Stubbirn Love” and the huge radio anthem “Ho, Hey”. They are set to release their third album in September just ahead of these your dates, entitled ‘3’ it’s their first release since 2016 saw their second album ‘Cleopatra’ make waves.